Taking a break from our usual angry metal bands to pay respect to a legendary classic American rock and roll band, REO Speedwagon. When I was a kid, my brother and I would ride in the backseat of our parent’s car on the way to church listening to You Can Tune a Piano but You Can’t Tuna Fish (1978) on 8-track tape. Yes, 8-track…I said that! And we wore that tape out! What a great album. We were sad to hear about guitarist Gary Richrath passing away on September 13, 2015. We are honored to present this amazing photo gallery by Mark Schierholz from an incredible performance at the historic Midland Theater in Kansas City, Missouri on November 05, 2015. 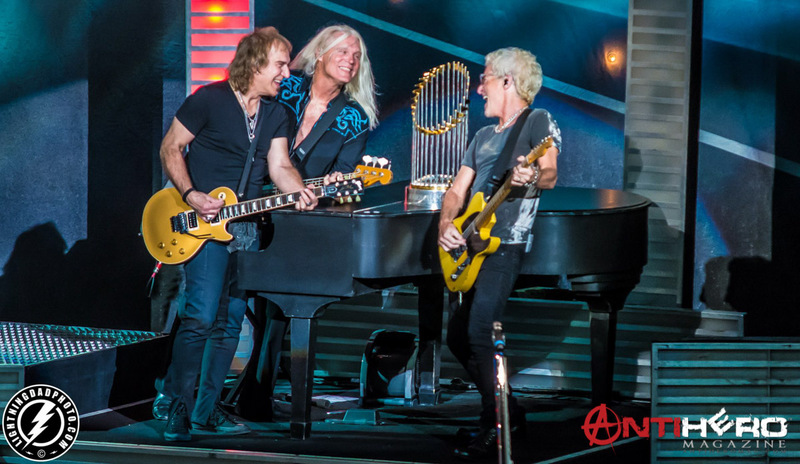 The photo above shows Dave Amato, Bruce Hall, and Kevin Cronin with the MLB Commissioner’s Trophy awarded to 2015 World Series champions, the Kansas City Royals!